Sad eagle news today. I did not know him that well. Many people knew him well. I just watched him on a cam. He was a magnificent male Bald Eagle. I give to him in tribute my best photos done in an art program. These are not him as I do not have any real photos of him as I do not live near that nest. The nest is in Iowa. These are other pictures I had of very proud eagles just like him. There are many people today and tomorrow giving tributes to him. People knew him for many years. 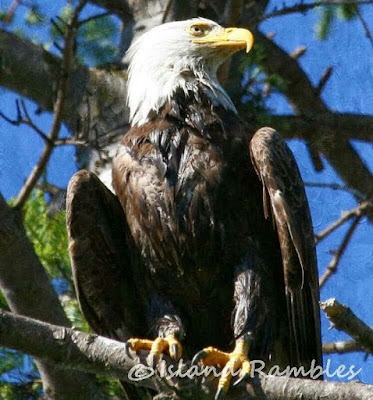 The male eagle from the Decorah nest has been missing for around 12 days now I think or more. They can not find him. 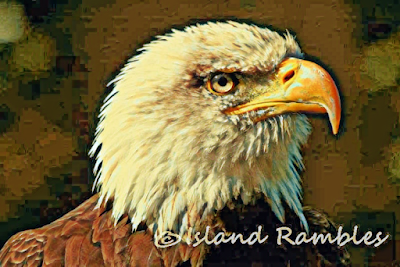 The Mom eagle is left with three very young eaglets in the nest to feed and look after. There is an unidentified male interloper there. I feel really terrible and down in the dumps. I feel like I can't do anything anymore. I feel like everything is pointless. I don't want to watch the cam anymore because I don't know what will happen next. 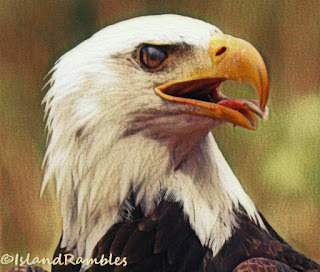 I get too attached to animals especially eagles and they stay in my heart forever and I have a tender heart. My heart is broken for the poor female eagle and the three babies. I don't even know how to send this tribute to the right place so I put it on my blog and I am too shy to go on all the chat lines. They are having a service and remembrance of Dad Decorah on Wednesday at the Facebook site and the Webcam site. I am not sure how to get to them. I will try to add the links here somewhere. Sorry for this posting but I am not my usual self these days. 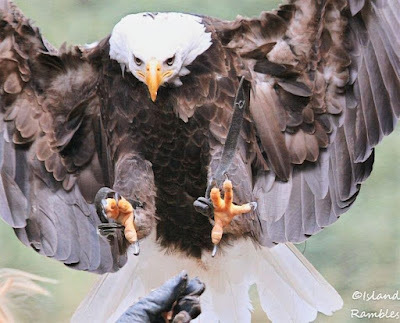 These pictures are not of the Decorah eagles they are just some photos of mine. Your pictures are wonderful,great tribute.I saw your fabulous pictures of the Island in your facebook too.Just breathtaking! thanks so much Louca por porecelana. Oh NOra and his friends will miss him. It is sad news, but it is life. 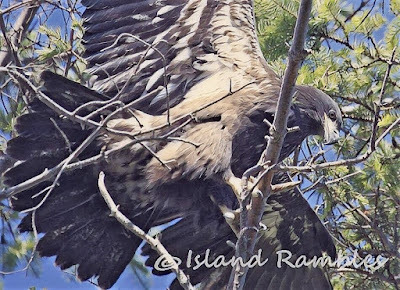 Our Florida nest lost its older male "Ozzie" a few years ago .... he was injured probably by a train, rescued and healed by one of our great Animal Rescue organizations and returned to the nest, but then later during the same season was killed in a fight with another eagle. 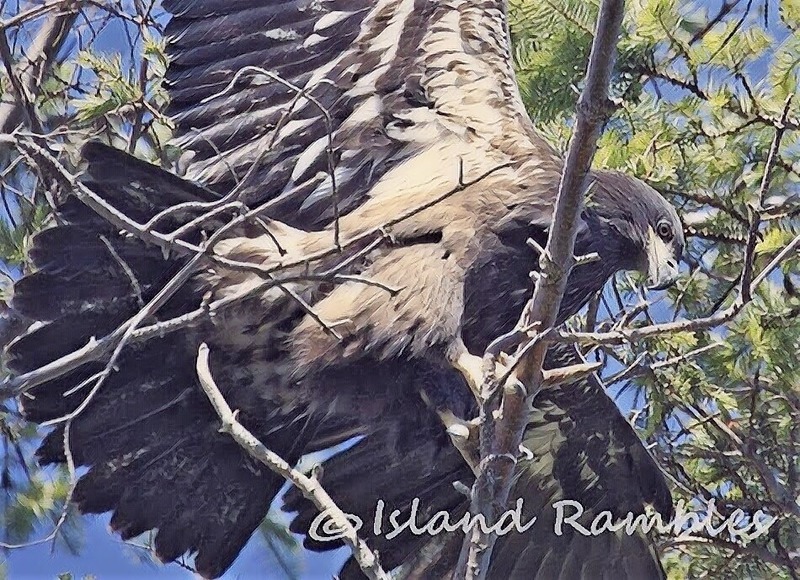 Harriet had two eaglets to finish raising alone that year -- but I think they were probably older than the Iowa nestlings. The female Harriet is now mated with a younger male and this is the second year they have hatched successfully at the same nest she has always had. Watching the animal cams can be very educational... sometimes more than we want to be educated... but we all know that life can be hard sometimes (I know you know this very well) .... I try to keep my blog a happy space too usually, but know we have to face reality. Thanks so much Sallie. Yes I remember the Florida nest and Ozzie. It was so sad also. I guess the eagles carry on better than we do. It goes to how nature makes them all survive as a race. The strong shall survive. It is really hard to watch some of the cams as it is real and up close on the cam. It is educational and wonderful also and rewarding and helps to further our understanding of nature and we learn things that no one ever knew before but the harsh part of nature is also there. As a species I guess it works for the stronger males to survive and fight with the weaker older males and take over their territory and take over that nest and the female. But those are long relationships that the eagles have with each other and it is hard not to put human emotions onto their lives. 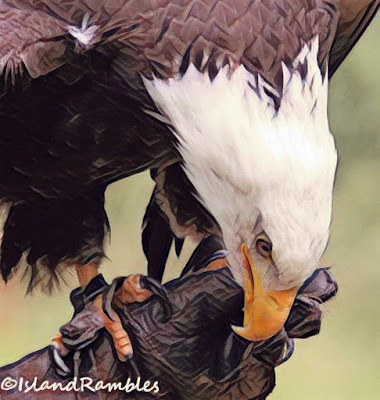 The cams bring the eagles right into your home and into your life so they become part of your everyday existence and you become witness to their intimate lives with their struggles and their joys. It is really hard when one just is gone and there is no reason or knowledge of it. I agree with all of what you said, Nora and you said it beautifully. The birds that mate for life have a special place in our hearts. I try to remember that they are not humans -- there's a word for that which I can never spell without looking up 'anthropomorphize' .... it is really hard not to do that. I love watching the Eagles. We have quite a few redsident Eagles and this area (Skagit Valley) is winter area for the great raptors. Thanks so much Small City Scenes, yes you have lots of eagles there for sure! Amazing shots! I wonder what has happened to the dad eagle? Hope he comes back! Hi Fi, yes we don't know what happened to him. They had a search party of many people that looked for days for him but it is sometimes impossible to find an eagle especially if they are injured as they go and hide. I still think he will come back or be seen around the nest but is being driven off by that other eagle there. 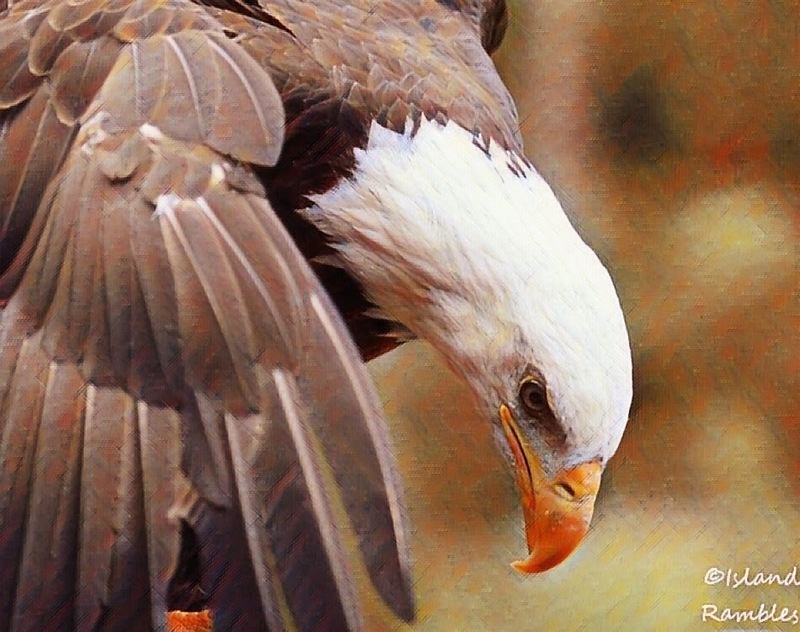 It is sad to think this eagle is gone. May his spirit soar and his progeny make him proud! Thanks so much Pat. I think he would be proud of his work that he did as a teaching eagle if I were to use human emotions. 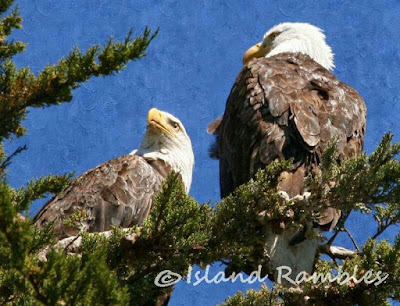 Also he had many many young eaglets over the years and was a great provider of food. The conditions were harsh there with a late snow fall and the amazing eagles cared for three babies during heavy snow. I did not think they would give up looking for him yet though. I am really shocked that they have no news at all of him as so many were looking out for him. 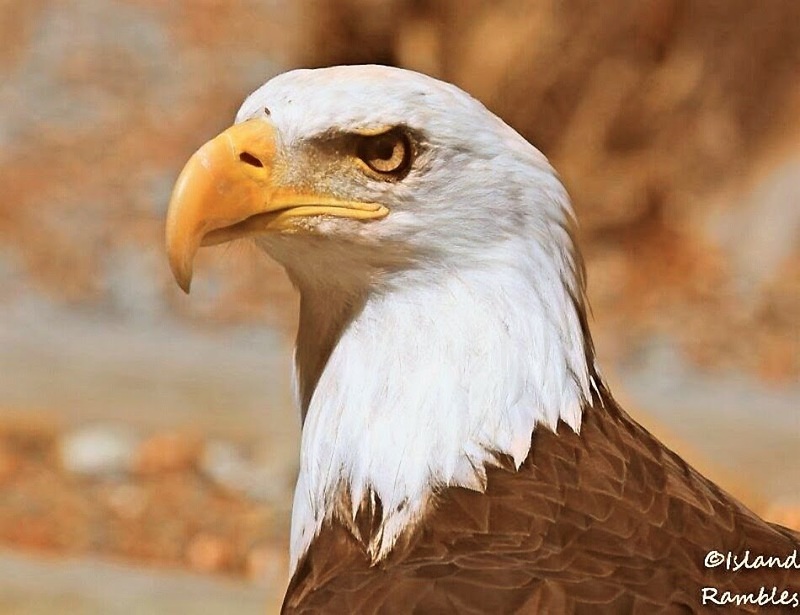 He may not be the eagle in your photos, but the photos are great, and so is your tribute. Beautiful photos of your eagles. Sorry to hear about the one you were watching. I hope something comes along to cheer you up soon. Nora - as others have said, Nature can be cruel. It is hard for us when we are brought so close by the blessing of technology. 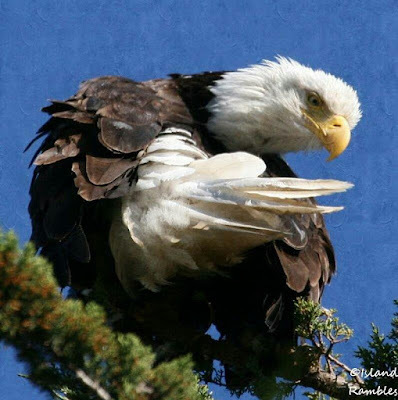 I can only suggest that we take the long view ... eagles have made a terrific come-back in so many places and they will flourish as a species even if one does not. That is sad but life for natural species. Hopefully another will take his place. Shame that he has gone. These are good pictures.